The UK experiential craft brewery Drygate has made its debut into the canned beer market with a studio range that showcases the symbiotic relationship of art and brewing. Always focused on breaking down the barriers between brewer and beer drinker, the Glasgow brewery has moved its small batch studio range to cans featuring psychedelic characters based on artwork by John Felix. The artist, who moved from van to can, originally started out as a Drygate van driver and is now a full-time illustrator. Four beers will now be sold in cans across the studio range, which feature individual designs by the Glasgow-based artist comprising Chimera India Pale Lager, Crossing the Rubicon India Pale Ale, Orinoco Breakfast Stout and Disco Forklift Truck. 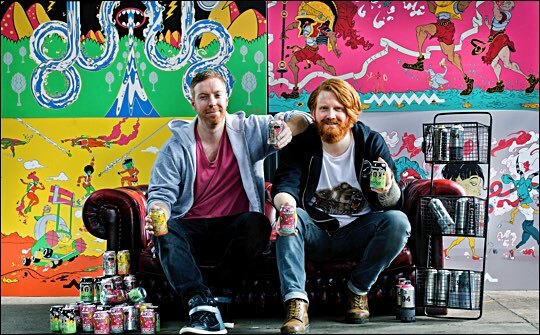 Felix says: “The can artwork is psychedelic, abstract character illustrations that are inspired by the brewery's tendency towards anthropomorphic strangeness in its designs. Anyone who has picked up a Bearface Lager or a Gladeye IPA, respectively adorned with a half-man half-bear and a mustachioed cyclops, will find these new designs in perfect keeping with this other-worldly aesthetic. “The artwork is inspired by many sources, from Moebius to Miyazaki to Frank Quitely and predominantly my love of comic books, in particular, the graphic novel SAGA, where the illustrator Fiona Staples has created a universe populated by shape shifting humanoids. "The design brief was to build on the beer names which was rich in iconography to go from; Chimera being the Greek mythological hybrid of a lion, goat, and snake, which I had great fun transforming into 3 strutting Glaswegians each representing one of those animals. “The artwork for Disco Forklift Truck was something brewer Ed Evans envisaged as being a sort of Parliament-Funkadelic space opera. Crossing the Rubicon refers to Julius Caesar crossing the Rubicon River to march on Rome in a famous act of insurrection. With Orinoco, brewery manager Matt Corden wanted me to represent, in a graphic way, the Venezuelan river from which the beer derives its name and its ingredients. “It was a fantastic project to work on, with great art direction from Drygate. Matt Corden, operation director of Drygate Brewing adds: “Now in our third year, Drygate’s mission to collaborate, curate and cultivate continues by driving forward experimentation and innovation. That’s why we decided to get creative with cans not just to meet growing consumer demand, but importantly to reflect the art of our brewing in our new can studio range.